Nearly 60 years ago, after serving his country in the skies over the South Pacific, Jack Taylor came home to start a business. He was a proud member of the “Greatest Generation,” serving as a decorated U.S. Navy fighter pilot in World War II. He often credited the lessons he learned in the Navy – including integrity, hard work, team spirit and simply doing the right thing – with helping to shape him as a person and as a businessman. 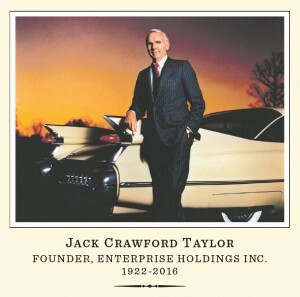 Jack founded Enterprise in the lower level of a Cadillac dealership in 1957 and grew the company into the world’s largest and most comprehensive car rental provider. Another value he deeply believed in was the responsibility to give back. And he displayed that belief with a boundless generosity that won him an enduring reputation as a philanthropist – and led to the establishment of the Enterprise Holdings Foundation. Many employees have accessed Foundation funds to support organizations in their own communities and, to date, the Foundation has contributed more than $200 million to thousands of non-profits. Jack also personally donated more than $850 million to causes near and dear to his heart. Jack left a legacy of opportunity for tens of thousands of grateful colleagues, and a legacy of generosity in the communities Enterprise serves. Jack taught his employees that success lies in getting the little things right. That working hard and having fun go hand in hand. That great things happen when we listen … to customers – and to each other. So, thanks, Jack. For everything. For more information on Jack Taylor and his legacy, visit http://www.jacktaylorremembered.com/.